As Sri Lanka deliberates its economic future and the major reforms that are needed to charter a resilient and viable course, it is important to get beyond the cliché’s of growth-speak and pay attention to the existing structure of the economy. In doing that, the farmer, covering all sectors of agriculture, looms large. In the labour force surveys of the Census and Statistics Department, 28.5 percent of the labour force report themselves as working in the agriculture sector - farming. What the labour force survey counts as agriculture includes not just farming but also what is planted on the ground in terms of paddy, vegetables, fruits, spices, tea, rubber, coconut, etc. It further includes forestry, fishing and livestock farming. However, gross domestic product (GDP) statistics show that all these sub-sectors combined contribute only 10.1 percent to GDP. That means, statistically 1 percent of the labour force working in agriculture produce only 0.35 percent of GDP. This is in contrast to 1 percent working in the industrial sector producing 1.22 percent of GDP and 1 percent working in the service sector producing 1.28 percent of GDP. Therefore, those working in the agriculture sector are the least productive workers in the economy. To put this in different comparative terms, workers in the industrial sector are 3.4 percent more productive and workers in the service sector are 3.6 percent more productive (see Exhibit 1). In a society where people are significantly free to choose their area of work, workers will tend to leave unproductive sectors and move towards more productive sectors – because the wage per day of work in such sectors will be higher. When the productivity differential is as large as around 3.5 times (350 percent), ‘exit’ should be expected to happen rather quickly. 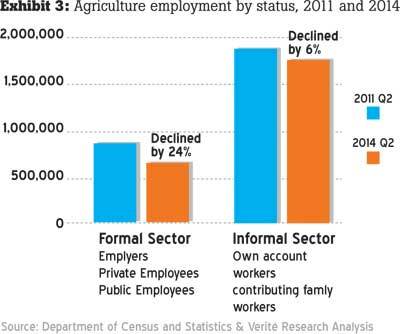 The data shows that there is labour force movement out of agriculture. 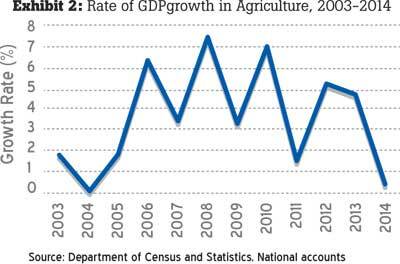 In 2011 (when countrywide labour force statistics become available) 33 percent of the labour force was in agriculture. That means, on average 1.5 percent of the labour force have been exiting the sector every year. It is possible that the ‘exit’ from the sector is driven by the youth entry into the sector being less than the rate of retirement. Even as far back as 2002, when the last agriculture census was carried out, it became clear that the sector was characterized by a relatively aging population. The agriculture census of 2002 showed that 58 percent of agricultural operators were above 45 years of age while 31 percent were above 55 years. This was well above the older age representation in the total labour force. (An agricultural operator is defined to include those who make significant decisions with regard to the farming activity). There is a view amongst economists that the labour force survey data over-states the full time equivalent in the agriculture sector and that agriculture sector workers could have additional part-time employment in other sectors. While this needs corroboration by government surveys, it adds to the concern that those in farming employment do not find it easy to find adequate alternative employment in other sectors to fully make the move from the low productivity trap in agriculture. With a large proportion of Sri Lankan families trapped in agriculture, Sri Lanka’s economic reforms cannot ignore this sector. There are three types of public and private sector initiatives that can alleviate the problems of the farmer: (1) Increase support for success in existing farms (2) Increase mobility towards more productive farming (3) Increase opportunities for mobility to the industrial sector. (1) Increase support for success in existing farms: At present, weather patterns have a huge consequence on agriculture output. Exhibit 2 shows that output growth is subject to much volatility and most of this can be explained by normal fluctuations in the weather. Sri Lanka’s infrastructure in the agricultural sector to provide farms with predictive weather and water-related information, crop planning methods and guidance on contingency arrangements, has not received the necessary investment. Fixing this informational, planning and assistive infrastructure then becomes an important aspect of future economic engagement by the public and private sector. (2) Increase mobility towards more productive farming: At present, there are indications that the decline in farming employment is occurring more at the formal sectors of agriculture labour than the informal (see Exhibit 3) suggesting that agriculture labour is becoming less professional. However, if productivity is to improve, even small farm agriculture will need to grow in ability and professionalism. The lesson from the East-Asian countries that transitioned to upper middle income economies is that small-scale agriculture (size of a hectare and above) can yield high returns to land when focused on labour intensive export-oriented crops, if farmers are coached on techniques of productive farming. To achieve this transition Sri Lanka will need to revive and professionalise its failing agriculture extension services and agricultural research services that are vested in the public sector. (3) Increase opportunities for mobility to the industrial sector: One reason for the slow mobility out of the agriculture sector could be that opportunities in the industrial sector have not been growing fast-enough. While agriculture lost 1.5 percent of the labour force each year since 2011, the industry added only 0.8 percent a year. Due to the education and skill levels required in the service sector, apart from low level services (such as taxi-services provided by trishaws) agriculture workers are likely to have more job matching opportunities in the industrial sector. Therefore, sustaining future economic growth will also require the public and private sector to focus on increasing opportunities in the industrial sector to the youth who are rejecting the farming vocation of their parents. 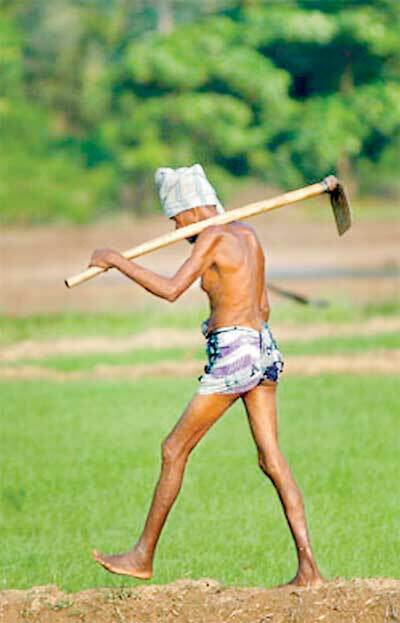 Historically and culturally Sri Lankan society idealises its farmer. Advertisements even for the recent presidential elections were replete with images of farms and farming communities. But economic policies and reforms in the last decade have failed the farmer. They tended to focus on an increasing array of subsidies and price guarantees that socialised the cost of low productivity farming, without developing the ability and infrastructure of the farmer. Future economic reforms should look to heal this productivity illness, not just administering costly pain-killers.